Immediately upon entering the game you get options for resolution: anywhere from 640x480 to 1960x1280, and you can choose the quality of the graphics as well (nice for those with slower systems.) If you want to play Windowed, check the option here. Once you're in and check out the Settings, you'll see there are three tabs with options: Display with Anti-aliasing (which I didn't touch; ) Audio with separate sliders for Music, Sound Effects, Voices, and Master Volume; and Gameplay with options for Subtitles, Hints, Tutorial, and English or Dutch for the language. SO, the game! Let's get to the game! I highly recommend having the hints and tutorials ON the first time you play... and maybe subsequent times, as well These are not invasive at all, and it's important to understand the mechanics, which are not your basic adventure fare! OK, some are pretty basic. For instance, click on an active item and see a circle with one to three options: An Eye (the better to see you with my dear!) a Hand to physically interact with things, and a Suitcase, which is how you use your inventory. Whatever item you have showing in the top right corner is the item which you'll try to use when you click on that suitcase button. So how to change the inventory item? Click on the square box at the top right of the screen to open your inventory. Now you have three options (again? Yes, again!) There's an Eye (same as above), a Hang (yes... same again!) and a Plus Sign, which is what you use to combine items. Sound complicated? It's really not, it just takes a little bit of getting used to. Back to the inventory, you select your "active" item (the one you're currently holding) by simply clicking on the item you want. You don't have to click on any of the options to change what you're holding. Double-clicking will make Erica run (yay!) and when we click on an exit, you automatically leave the scene -- we don't have to wait for her to walk over there. Very much appreciated! Hold down the space bar or click and hold the question mark at the top left of the screen to show you the active areas in the scene(s). Also at the top left are quick access to your cell phone (much easier and faster than accessing it through your inventory!) and clicking on the computer image will take you back to the main game page where you can SAVE SAVE SAVE! I recommend doing this often! For one thing here are choices you can make that will affect gameplay, and you may want to do things differently the next time you play. In the end you will find yourself in the same place, but the journey will differ depending on your actions. Second is that you can -- and will -- die. You get to replay this sequence as often as you need to, but still... knowing that you can die makes things a little nerve-racking! Your cell phone will be invaluable to you. You use to search the web, look up music, make phone calls (of course,) take pictures, look at the calendar, and make NOTES. Yes, you make your own notes. There is no journal -- if there's something you want to remember, be sure to add it to the notes in your phone. There is one other option: Message Dad. Sending messages to Dad is how you get HINTS in the game, and they are truly HINTS, and not just telling you exactly what to do. The art style is probably the first thing you notice about the game. They are very graphic novel-esque, with cartoon-like cutscenes. Don't let that throw you off! The voices and mannerisms of the characters are so beautifully done, and the story so intensely interesting that you quickly become immersed in this world. I'm kind of glad that the graphics aren't any more realistic than they are, as it would be just too much for me, I think. I'm so impressed with how well Phoenix Studios integrated realistic human movements into the characters, right down to the way we tend to rub our fingers together to get the salt off after we've eaten a potato chip. VERY NICELY DONE! The story itself is gritty and dark, as would be expected with a real life-type environment. We have horrible antagonists, strong personalities, some f-bombs, and semi-disturbing imagery. It's not gory but do expect to see things you would see on a crime-type TV drama. Speaking of which, our forensics guy and someone we interrogate remind me strongly of characters in Criminal Minds, and that's an apt comparison since the game kind of plays out like this TV drama: Intense, full of personality, and very interesting. Ahh, I just realized that I haven't mentioned what's so different about the gameplay, yet! Haha, there's just so much to mention! What we have is a psychic detective! As we progress through the game, we learn new ways to use our abilities. Hopefully you've got your tutorial on so that you'll learn what that's all about! To use your abilities, you click on the glowing ball at the bottom left side of the screen, then click on the item(s) you want to learn about and click on the ball (which will now have an image in it) again. The psychic abilities are, I think, what really makes this game stand out for me. It's so beautifully and seamlessly done... I'm just so impressed. For me the gameplay was very intuitive, and I love not only being able to make my own choices about how the story plays out, but also that there is freedom to explore as you wish. Yes, it if was more linear I wouldn't be traveling around so much, but in this game, I really LIKE that I had this freedom! Highly recommended if you like playing the detective! Glad to hear you enjoyed it!! I'm waiting for a killer deal on the whole season at GOG. Yeah, that's where I am now. I'm kicking myself for not getting the series when it was at Daily Royale, but I won the first episode in a contest, and at the time (of the sale) I wasn't sure I'd ever play it! Thanks to you Genki, i'm deep into Cognition I, and am so loving this game So you were right... I don't want to play the others. I MUST play the others i'm gonna fall behind on some other games I was so stoked to be almost caught up on, but it's a good trade off. I know I wont be ready to quit when this one's finished. After finishing Face Noir (a good one, btw), I thought i'd give the adventure thing a break but nooooo... Erica pulled me in so fast with that amazing opening, I couldn't even think about waiting another day let alone a week. Thanks again for sharing Who knew it'd be like giving drugs to a junkie - I just want more! Hey, wait a minute - YOU knew!! LOL. - j.
haha, yeah, I knew So did the gal at Phoenix Online who gave me permission to pass it along to you, I'm sure! That's how good it is! 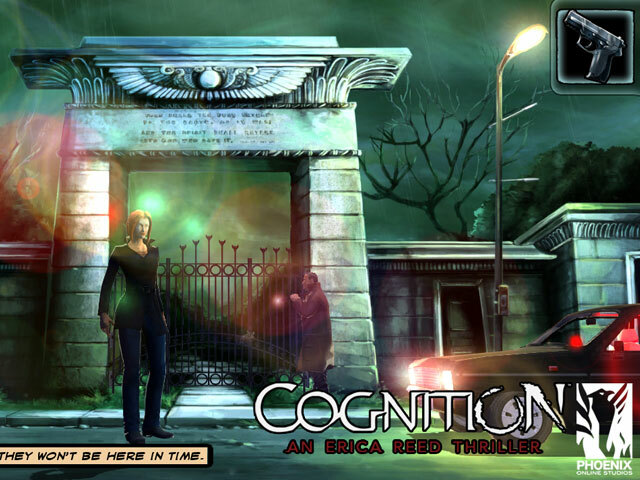 It may be that Cognition will come up in GOG's current sale, so keep an eye out! We're going to wait on a group play of Cognition for you to get the rest of the series, Jess. See? New Group Play Proposals. I will, of course, let you know when I see a great price! Okay, I gotta get Cognition, right? I mean, $7.49 for the full season - 4 parts, yes? And it's a cool game, not too hard for imbeciles like me? Where did you find the full season for $7.49? We must let jessmom know so she can grab it! Wooo, found it! Messaging Jessmom now! enjoy it. I absolutely loved the first (thanks to Genki) & can't wait to get rolling on the rest. If I was the character in a game, i'd be Erica. She's such a badass wench, I love it, hehe. Oh good, you found it. Was busy sleeping and only just now have seen your post, genki! Muwahaha Yes you will... because we'll be doing a group play of it as soon as Rmom and jessmom are ready to start! Actually, I am just fiddling around with it now, getting to grips with what it's about. I like it better than the others I have bought since I started reading all the deals you put up! I mean, I can see it, and I can read it, and I click on stuff and things happen! Cool! Have not yet managed to download all four yet, they are taking forever. Then I have 12 other adventures to download lol - heaven knows what that'll include! Today Cognition. An Erica Reed Thriller, an episodic point-and-click adventure story packed with challenging puzzles, branching paths, and a disquieting mood, is getting a free update to Game of the Year Edition and a permanent price drop! Not only you'll be getting plenty of fresh goodies--like developer commentary, a collection of concept art, or the GOG-exclusive vol.2 of the soundtrack, now the game costs only $14.99! Actually, scratch that! You can also take advantage of our GOTY Edition launch discount and get the game 33% off! That's only $9.99 for an entire goodie-packed season of Cognition. An Erica Reed Thriller! The offer lasts until Thursday, August 8, at 9:59AM GMT. Erica Reed is an exceptional detective, but being special always comes at a price. Her extraordinary gift, allowing her a peek into the past by simply touching an object, makes her the ultimate bloodhound, and yet, causes excruciating mental pain. Her own past is marred irreparably by a personal tragedy. Can she conquer her demons by solving one morbid case after another, or will the unfading shadow of her brother's killer torment her forever? The mystery thickens, as someone starts leaving clues, that can only be uncovered with the use of Erica's unique ability. Who? Why? Can the troubled detective last long enough to find out? Uncover dark mysteries behind grisly killings and lead detective Erica Reed to absolution over four tension-filled episodes of Cognition. An Erica Reed Thriller is available DRM-free for Windows and Mac OS X, with Game of the Year Edition goodie pack, only $9.99 for an entire week! Excellent news. I got this in the Insomnia sale a while ago, and LOVE it! So to get this GOTY update made my day. GOG is killing me with kindness. They're putting everything on my wishlist on sale. My game budget is blown for the rest of the year. But I am still buying this despite the fact that most of the reviews say there are real immersion-breaking aspects (like poor dialogue and shoddy police procedure). Unless I truly can only get one game right now ... then the Trine update has to win. Choices, choices, choices. Games are as bad as books for my budget. They just don't get along. I didn't have ANY immersion troubles with Cognition! Of course I've only finished the first episode, but I truly loved it! genkicoll wrote: I didn't have ANY immersion troubles with Cognition! Of course I've only finished the first episode, but I truly loved it! Well that settles it ... I'm getting another game. Yep; I think I need a Genki talked me into it folder too! Thanks!